"here, a rain front washed through. the peonies are floored. i just was outside, trying to perk them up a bit. picture to follow. we could start to work on a flower-collaboration ;-)"
there it was. the idea. on the page. the answer to it was a base concept. "did you get a photo of the peonies in their 'floored' state? that could be interesting to embed in a flower collaboration piece somehow (if you were actually serious in your last e-mail re: initiating such a thing)! - which so many spring and summer flowers are. perhaps if we did something, we could call it that - POP!" and so Karyn and i moved from our first collaborate work (Dealing with Family and Friends) to dealing with flowers and pop associations. and arrived at POP UP poptagon. it took a while to get that one together. now it is complete. 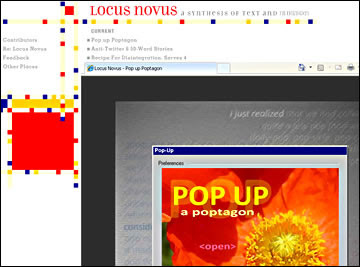 and up in Locus Novus, a magazine that is all about synthesis of text and images and sound. thanks to Faruk Ulay, editor of Locus Novus and flash wizard, the POP collaboration now even includes some extra pop effects. the floored peonies are included, too -- you see them when pop turns lilac.